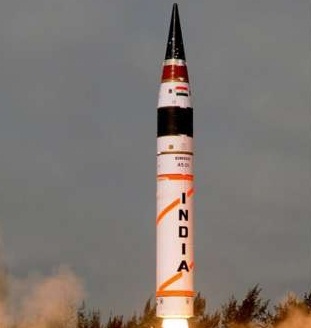 NEW DELHI: India today tested the Agni-V intercontinental ballistic missile+ (ICBM) from Wheeler Island off Odisha. After the user trials, this ballistic missile will be inducted into the Strategic Forces Command (SFC). The nuclear-capable Agni-V can even reach the northernmost parts of China with its strike range of over 5,000-km. It was test-fired from its canister on a launcher truck about 11 am. “All the test parameters of the missile, which was tested for its full range, were successfully achieved. The missile splashed down near Australian waters,” said an official. This was the fourth and final experimental test of the three-stage Agni-V. The launch was delayed by two years as a technical correction was required. Also India had to overcome the hurdle linked with its entry into the 48-country Nuclear Suppliers Group that was earlier blocked by China. India joined the 34-nation Missile Technology Control Regimerecently.